Abstract: Amphibole gabbroic rocks with heteradcumulate and isotropic fabric constitute centimeter to hectometer large fragments in the Early Callovian to the Late Valanginian ophiolite melange of the Mt Medvednica located at the SW tips of the Zagorje-Mid-Transdanubian Shear Zone. Normalized multielement concentration patterns have strong Ta-Nb anomaly [(Nb/La)MORBN=0.28–0.72] for all rocks, while normalized REE concentration of isotropic gabbros show patterns transitional between mid-ocean ridge and island arc magmatic rocks [(La/Lu) MORBN=0.92–1.12]. Low Ti, Cr and Na content of clinopyroxene from the isotropic gabbros (<0.98 wt. % TiO2, <0.94 wt. % Cr2O3, <0.39 wt. % Na2O) combined with high Ca-plagioclase (up to An93) and crystallization of plagioclase after augite-diopside with tschermakite-magnesiohornblende as intercumulus oikocrystal bring in the evidence of formation in a suprasubduction setting. The rocks were severely albitized and uralitized in greenschist facies on the sea floor and altered in prehnite-pumpellyite facies during emplacement. Due to the alterations the LILE may have been selectively enriched while HFSE and REE retained magmatic ratios. 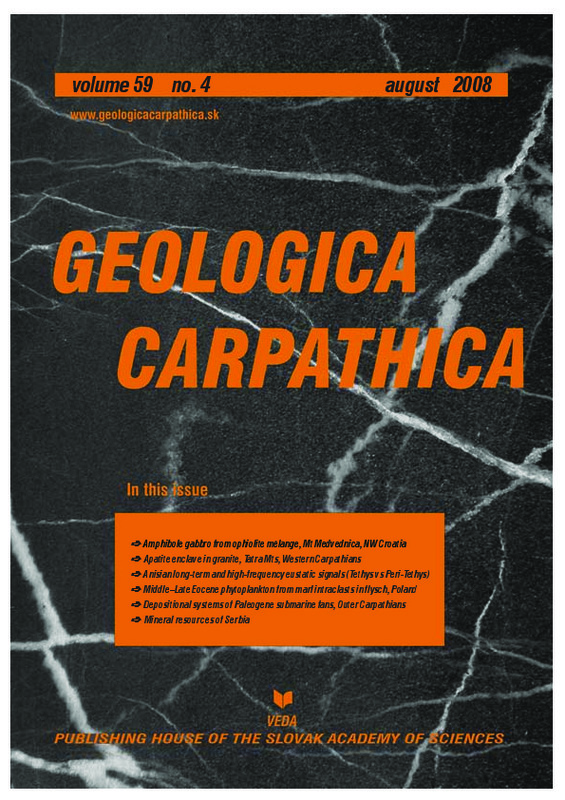 Overall geochemical data and age determination of gabbropegmatite (161.1 Ma) are liable to geotectonic constraints and advocate a proto-arc–immature intra-oceanic island arc source of the Mt Medvednica gabbroic fragments. It was suggested that the Mt Medvednica gabbroic rocks represent remnants of an extinct intra-oceanic arc system formed in the Repno domain of the Neotethyan oceanic realm. A petrogenetic and geotectonic connection between the Repno and Maliak-Dinaric oceanic domains cannot be positively postulated on the basis of the presented data. Abstract: A mafic, coarse-grained apatite-rich enclave found in the High Tatra granite, Western Carpathians, is an ultrapotassic rock with mixed (mantle-crustal) geochemical and mineralogical signatures. A U-Pb zircon age dates the intrusion at 345±5.1 Ma. Zircon cores preserve ages of 361±7.6 Ma and 391±4.6 Ma. The apatite-rich rock could be interpreted as a cumulate material related to common Tatra granite of comparable age (360–340 Ma). This rock, of very unusual mineralogy, is an atypical cumulate formed in rocks of granitoid composition. Abstract: During Anisian times, broad ramp systems developed on the northwestern Tethys shelf and in the adjacent Peri-Tethyan realm. In both paleogeographical settings carbonate series display characteristic cyclic patterns, reflecting long-term and high-frequency eustatic sea-level changes. Facies successions recognized within the small-scale sedimentary cycles document a rapid transgressive phase followed by a prolonged highstand phase. The erosional base of these deposits is interpreted as a sequence boundary. Transgressive deposits are characterized by bioclastic limestones with reworked lithoclasts. Bioturbated mudstones represent the highstand deposits. Sedimentation of laminated mudstones is documented during the late highstand phase. Maximum flooding is recognized by thin condensed marly layers at the top of bioclastic beds. Such meter-scale sedimentary cycles are the basic stratigraphic building blocks of the Anisian series of Hungary and Germany, representing ramp deposits of the proximal Tethys shelf and the northern Peri-Tethys Basin, respectively. Comparison of both depositional environments leads to a better understanding of cyclic sedimentation of shallow-water carbonates and controlling factors. Eustatic signals of different scales are analysed and used for correlation of sedimentary series between different paleogeographical settings. Abstract: Organic-walled dinoflagellate cysts and calcareous nannoplankton are described from marly intraclasts found in submarine slump deposits within the Lower Oligocene Szaflary Beds exposed in the Leśnica Stream. Their Middle and Late Eocene age implies that the investigated deposits are coeval with the basal deposits of the Podhale Paleogene succession. These Middle and Upper Eocene marl intraclasts were eroded and transported into the flysch basin during the Early Oligocene. They represent the sediments deposited in the northern part of the Podhale Basin that is not exposed in recent times. Paleoenvironmental analysis of microfossils suggests sea-level oscillations during late Middle-Late Eocene (Bartonian–Priabonian) with its maximum during the earliest Late Eocene (earliest Priabonian). A drop of sea surface temperature during Late Eocene is also suggested on the basis of high-latitude microfossil occurrence. Abstract: This paper gives an overview of the depositional systems and paleogeography of the submarine fans in the western part of the Magura Basin. Four fundamental petrographic groups were distinguished within the sandstones of this area: Solan, Riecky, glauconitic and Magura group. This classification responds to four source areas supplying sedimentary material into the western part of the Magura Basin. The sedimentation developed in a few separated depositional cycles. First the massive to the basin prograding wedge of the Solan Formation was deposited along the northern margin of the Magura Basin during the Late Cretaceous to Early Paleocene. Later the central zone of the basin subsided probably more significantly. The coarse-clastic sedimentation shifted in the Raca Zone from the margin into the deeper part of the basin as a result of this subsidence since the Early Paleocene. The depositional fans of the Riecky sandstone type were formed there. Uplift of the Silesian Ridge advanced from the W to the E during the Middle Eocene. Its result was the shifting of the source of the sedimentary material. This new source supplied to the basin glauconite sandstones from the NE. This sedimentation represented an asymmetrical fan of the proximal coarse-grained Pasierbiec sandstone type and pelitic distal facies. Sedimentation of the Riecky sandstone type was renewed with a reduced volume once more during the Middle Eocene. The period of the subsided and uplifted basin floor blocks followed rather flattened subsidence of the basin floor since the late Middle Eocene (Lutetian). Two extensive depositional fans developed parallel to the basin elongation direction in that time. These were the glauconitic and Magura fans. Both fans existed side by side simultaneously and interfingered each other. These fans prograded from the South into the Raca sedimentation area. The depositional systems and paleogeography of the submarine fans in the western part of the Magura Basin were controlled mainly by basin floor subsidence, by the local sediment supply, synsedimentary tectonics, by the progress of the subduction of the southern Magura Basin margin and also by the depositional pressure of the adjacent fan. Abstract: The mineral resources of Serbia were formed by complex processes of metallogenic development and in various geological epochs (Pre-Baikalian to Alpine). Their overview in this paper is supported by the simplified Metallogenic map of Serbia showing virtually selected mineral deposits, as well as by maps of the most important fossil fuel resources. The most important group of metallic mineral resources of Serbia includes Cu, Pb-Zn, Au, Ag, Sn, Mn, U, Mo, Ti, W, Co, Sb and Fe ores. The important group of industrial mineral resources include: bentonite, boron minerals, refractory clay, gypsum and anhydrite, diatomite, dolomite, zeolite, kaoline, quartz sand, cement marl, ceramic clay, limestone, magnesite, phosphates, chrysotile-asbestos, building industry granulates (natural and crushed) and decorative stone. Serbia also has significant resources of fossil fuels, particularly coal and oil shale. The soft brown coal (lignite) is of great economic importance since it represents the main source for the production of electric energy. The remaining petroleum potential of the Pannonian Basin in Serbia indicates that modern exploration may result in the discovery of significant additional reserves of oil and gas. Production of shale-oil also has great potential, but it depends on future detailed valorization of various factors.